"When It Rains, It POURS!" Beware of Scams, Identity theft and Hi-jacks on FaceBook and Gmail – Twitter Saves The Day! This morning I got an email from Fred Carver, an AR member I know well. It came via Fred’s gmail account. Sorry i didn’t inform you about our traveling, we presently in London UK stranded.Got Mugged last night at a gun point all cash, credit card,cell phone and valuable things where stolen away from us during the Robbery I will like you to assist us with a soft loan urgently with the sum of $1500.we need to sort out the hotel bills and get ourselves back home. we will appreciate whatever you can afford, i promise to pay back as soon as i return, Please let me know if you can help. how much have you raised? Good luck my friend, wish I could help you! I just got ripped by the government in property taxes, I have 3 kids and a wife that have no income, an overdue house payment, and a car that’s out of gas and I’m trying to figure out a way to get to the airport. If that weren’t enough, we have some person that wants to sue us for $60,000 dollars from a car accident and our deductible is exactly $1500.00 dollars, the exact amount you need too. Go figure… I just don’t have the nerve or guts to ask anyone for it like you. You’re a better man than I. I hope everything works out for you my friend and yes, it’s great you have your life and your passport. hey, how come you’re not answering your phone??? Then ALL OF A SUDDEN… 7:17am Fred is offline. 7:28am Brad tries to say…. Where should folks send you money? The lesson here friends is that we are all targets for scammers and no one is really protected against this type of thing. I’m not sure how this happened to Fred. I have contacted him to let him know, but keep your eyes and ears open at all times. Be aware that these types of things are happening out there in the social media sphere and even with peoples email. Guard your information always and protect passwords by changing them from time to time. It’s not about just being street smart anymore, it’s about being Internet smart these days too. Had I discovered this really was Fred, and he really was in trouble, of course I’d be doing all I could to help him out. 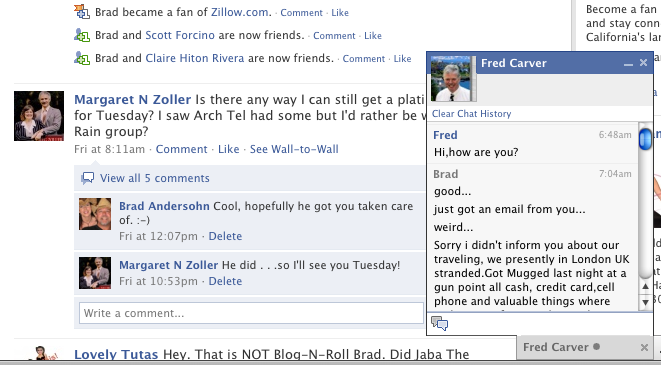 How many others have been contacted in Fred’s Gmail address book and from his Facebook account? Have others possibly fallen for this scam and sent money to an address in the UK? Hopefully not, but if you’re a friend of Fred’s or in his address book, then chances are, this post comes as no surprise to you this morning. Keep your instincts sharp and in check, and Beware of Scams and Hi-Jacks on FaceBook and Gmail. I look forward to Fred’s response to this post so we can get to the bottom of this and get… the rest of the story…. « A Call to All Members – ActiveRain University Wants You! "Your Internet Guide & Concierge"
friv games on Zillow Mobile App Now On BlackBerry!